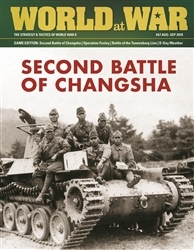 The Battle of Changsha is a two player, operational level game of the second (September to October 1941) battle for Changsha, China, capital of the Hunan Province. The first Battle of Changsha had been fought in 1939 as part of the Second Sino-Japanese War and resulted in Changsha being the first Chinese city to successfully repel the Japanese advance. The second battle in 1941, resulted in the city being captured (after most of it was destroyed in a fire) by the Japanese, and then being recaptured by the Chinese 9th Army Group commanded by Gen. Xue Yue. The third battle was originally intended by the Japanese to gain control of the city and prevent Chinese forces from reinforcing the British forces engaged in the defense of Hong Kong. When Hong Kong fell on 25 December, the Japanese decided to continue the offensive to gain control of Changsha thereby dealing a major blow to the Chines war effort. Most ground units represent battalions and regiments. Each hex is 3km across and each game turn represents 1 to 2 days. Components: 22x34 inch map, 280 die-cut counters.